Deshaun Watson rarely panics, not as a high school star in Georgia watching his mother fight cancer or as Clemson's quarterback working to come back from knee surgery. Calm and confident without being flashy, Watson’s style led the Tigers to their first undefeated season since 1981 - and a chance to accomplish much more. Watson’s mother, Deann, says her son has always been steady and on task, more concerned with solving problems than worrying about them. “That’s never changed with him,” she said. Watson was the one, Deann said, who brought home the Habitat for Humanity flier that helped the family leave public housing for a home of their own. Deshaun Watson did not collapse with his mother’s diagnosis. Instead, he dived into research to make sure it was not “death cancer” as he called it. It wasn’t. Deann Watson went through radiation and chemotherapy and is currently free of the disease, her son said. Deshaun Watson has brought that to the field this season, the best player on the country’s No. 1 team, and a Heisman Trophy finalist. Right now, that’s to the top of the college football world. Watson brushed both aside. His season took flight in rain-soaked Death Valley as he led the Tigers to a 24-22 win over Notre Dame that shot Clemson (13-0) into the playoff conversation. Watson has not slowed down since. He led the Tigers to eight straight wins since then with over 500 yards of offense to finish the regular season. He's thrown for 3,223 yards and 27 touchdowns. He’s run for 756 yards – he’s gone past 100 yards rushing in three of Clemson’s final four regular-season games – with another nine scores. Clemson coach Dabo Swinney said Watson gives the Tigers an edge that no one else in college football has – the best player in the country. Watson always felt that if he played solidly and the team was successful, individual honors would follow. Last week, he won the ACC’s player of the year and now makes his first trip to New York, where either he or running backs Derrick Henry of Alabama or Christian McCaffrey will be awarded the Heisman on Saturday night. HEISMAN-DEFINING MOMENT: In the regular-season finale, Clemson saw its 18-point lead over South Carolina dwindle to 28-25 in the fourth quarter. It was third-and-7 at the Gamecocks’ 33. After a time out, Watson came through with a 24-yard completion through traffic to set up a first-and-goal. Three plays later, he finished off the drive with his fourth TD of the game. BEST GAME: Criticized for not throwing long much the first half of the season, Watson answered with a 34-17 victory over Boston College on Oct. 17. The Eagles came into the contest with the country’s No. 1 overall defense, yet Watson passed for a season high 420 yards, including TD passes of 51 yards to Artavis Scott and 21 yards to Zac Brooks. WORST GAME: Watson’s worst game came against Louisville on Sept. 17. After two easy wins over Wofford and Appalachian State, Watson and the Tigers went on the road for a Thursday night showcase expected to display their skills. 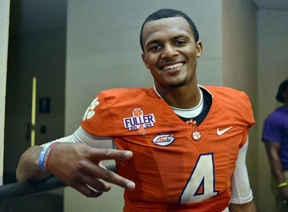 Instead, Watson threw two interceptions, but Clemson held on for a 20-17 win.